Why Do People Move to First World Countries? 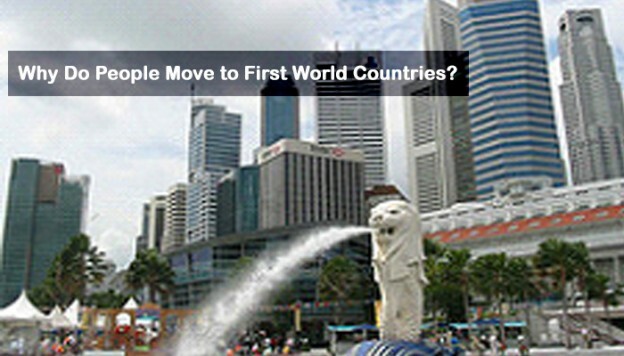 Home > Morevisas Immigration Consultants > Why Do People Move to First World Countries? You have surely heard a lot about first world countries. You have heard about the job opportunities that first world countries have, and you have probably thought about moving your family to those nations. However, why do some laws refuse people from moving to first world countries of the globe? Why are there some who feel that there simply are not enough laws to keep immigrants at bay within first world countries? First-world countries provide refuge to hundreds, if not thousands, of immigrants from other countries. The United States of America, one of the best known first-world countries, was essentially built by immigrants from all over the world. So it makes sense that so many people from other nations still want the opportunity to move to first-world countries and build a new life for themselves and for their families. However, this effort may not be as easy to carry out as it would seem. There are significant laws that need to be adhered to and significant paperwork that needs to be completed for any and all immigrants to first-world countries. Plus, immigrating to a first world country is harder than immigrating to different nations. Therefore, the stipulations are much stricter. The issue of immigrating to fist-world countries is that everyone wants to immigrate just like you. That means that first-world countries can be stricter with the laws that they implement around immigration. This also means that the cost of immigrating to these first-world countries can be significantly more expensive than immigrating to other countries. Laws can be easily enacted around immigrating to first-world countries because so many people want to immigrate. That means that the first-world countries have all the power when it comes to laws around immigration to their nations. Still, if moving to a first-world country is the best thing for yourself and your family, then do it. However, you need to make sure that you do the proper paperwork. You need to make sure that you follow the laws to a “T” and that you do nothing wrong in the process of applying to immigrate to first-world countries. The cost of immigrating to first-world countries may become ever more expensive as the laws around the process may become ever stricter. However, if a first-world country is your dream, then you have every right to pursue it. That is what first-world countries are all about after all – pursuing dreams. How Can I Learn The Language of My Country? Why Do We Need a Passport for Immigration? I want to move UK for work…please explain how can apply to visa? My sister dream’s came to true because of Morevisas consultancy. thanks a lot Morevisas for given of visa to my sister.